Matakana Wine Country has vineyards, beaches, markets, recreational facilities such as Morris and James Pottery, Matakana Country Park for outdoor events, Leigh Sawmill Cafe. Tawharanui Regional Park, Goat Island for snorkelling and diving. Surfing and swimming at Omaha and Pakiri Beaches. Take a ferry to Kawau Island and further afield to Great Barrier Island. Charter a fishing boat to catch your dinner or just soak up this glorious coastline. The list goes on and on. Barbara has lived in Matakana for the past 16 years. She was originally attracted to the village while living overseas, excited with the developers plans and she became very involved working with the Didsburys in particular establishing the Matakana Village Farmers Market as the first market manager. She is now still the Matakana Bag Lady selling baskets and fabric bags and everything to save customers asking for a plastic bag!! I wanted to live in a village in our beautiful countryside and Matakana attracts the people I like to live in a community with. Creative, adventurous, hard working, risk taking and above all having a shared vision of living in an environmentally friendly responsible aware community. be part of an active community group using my experience for the benefit of the community. Casa Canna property is so close to everything. You can walk everywhere, go to the movies in 2 minutes, pop over for a takeaway of healthy delicious food, wander down to the Farmers Market on Saturday morning. Its a comfortable 70's house that extends around its guests to give them a base to return to each day. Cook and share a meal, sit in front of the fire in the winter with a glass of wine. There is ample parking for 3 vehicles so no village parking problems. Exterior doors wide enough but shower doesnt allow a wheelchair in easily. The property is brilliantly located right in the village. The house had everything we needed, beds were comfy, everything was lovely & clean, there is two toilets, plenty of outdoor furniture and the kitchen was stocked with delicious fruit, muesli, yoghurt and fresh local bread for our breakfasts as well as plenty of tea, coffee etc. Handy to village with everything you need. House is open with plenty of room & everything you want or need. Morning coffee on the deck ....bliss. Don't need car, just walk to village. Thanks Barbara, we'll be back. You're welcome and l'll love to have you back. 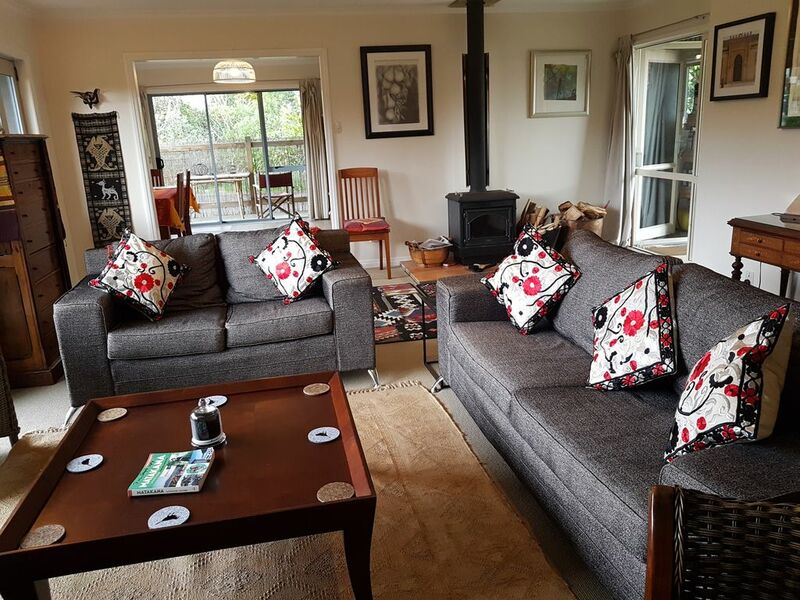 Comfortable, character cottage with all amenities, that couldn't be more centrally located in the charming village of Matakana. Great location, as described. Clean and tidy. Right across the road from the Markets, great location for a weekend get-away. Matakana, 2 minutes walk from Matakana Village centre. A comfortable three bedroom home with that special X factor. Suggestions to do. Places to eat. Matakana Farmer’s Market: Now in its 12 year you probably don’t need to be told about this but its on Saturday mornings from 8am to 1pm. You can walk from Casa Canna (3 mins) so don’t need to worry about the crazy parking problems. Great for breakfast or brunch. Good live music and you can say hello to the Matakana Bag Lady (ME)! In my stall selling market teatowels and baskets and bags. Matakana Pub: www.matakana.co.nz/ We provide a relaxed friendly environment, with fantastic service & a great selection of wines, beers and fresh food at really good value. 2 minutes walk from Casa Canna Properties. The Sawmill Brewing Company http://www.sawmillbrewery.co.nz/ First day and wow, food to die for, style to love, staff that care, faultless, with indoor and outdoor that are dreamy and perfect, art , object, bathrooms are even amazing! The Matakana Sculpturiam has just opened and is an amazing collection of art, objet’d’art, fun sculptures all in creatively designed gardens. Ideal for families. In this early stage you might need to book in the Rothko restaurant or go early which we did. Matakana Country Park: Just over the hill from the Matakana Village with plenty of Parking and fun for all the family - children friendly with the animal petting park, adventure playground, pony rides and much, much more! Home to the well known and fabulous Stables Restaurant and Bar and New Smiths Bar, Brambles Cafe, Art Matakana Gallery, Craft Shop, The Circuit Room gym, The Remedy Room and all other things Equestrian.- you can bring your pony for a holiday short term or have a long term area for grazing with full use of the equestrian facilities on site! Leigh Sawmill: After a day in the sea, there's nothing better than pizza and beer, and Leigh Sawmill is the perfect location. Only 2km from Goat Island, the Sawmill also offers a menu packed with healthy options, live music and an extensive selection of Sawmill Brewery beers. www.sawmillcafe.co.nz/ Famous for music, gourmet woodfired pizzas and fresh fish, the Sawmill Cafe; offers international cuisine with a unique New Zealand flavour. Mathesons Bay and Leigh Walks. The Leigh Harbour walk, the Leigh Cliff walk, the Waterfall Walk up the valley from Mathesons Bay beach. All to be discovered. Leigh is the closest town to Goat Island, "Leigh by the sea" isn't just the home of the Sawmill. This close-knit community is primarily a fishing village, exporting fresh fish nationally and internationally. We recommend you stop in and grab a snack at Lee Eats on your way to Daniel's Reef for a surf. Scandrett Regional Park About 30 minutes from Matakana in the other direction, at the eastern edge of Kawau Bay, consists of headlands, beaches, regenerating coastal forest and a historic farm area, complete with a homestead built in 1884. Tawharanui Regional Park boasts beaches, rolling pastures, shingled bays, native coastal forest and regenerating wetlands. Popular with campers, the park has 3km of beautiful white sand beaches and many informative Takatu Lodge interpretation panels providing information on park history, historic buildings, trees and restoration work, so a trip can be an educational adventure. Follow the orange markers for a short walk (30 minutes) along the Fishermans Track to Anchor Bay. Have more time? For a longer walk (1.5 hours) and more of a challenge, wander around the south coast over the rocks to Maori Bay (access from mid- to low tide only). Omaha The town has a surf club, a bowling club, an 18-hole golf course, playgrounds and tennis courts, so there's plenty to do for people of all ages. Omaha is easy to get around too, thanks to the network of walking tracks.